We’re on the home stretch now, moving towards the conclusion of the Lauer Division before moving this competition to its exciting climax! Not only did we have furious precon action this past weekend, but we finally had a breakthrough in the Prediction League as well. With one reader now in pole position, will it go right down to the wire? In the opener, Mortal Coil was trounced thanks to a surprisingly forceful performance from Lorwyn’s Elementals’ Path. Being comprised of five colours might often be mistaken for weakness, and indeed most threw their lot in with the Shadowmoor deck. “I’ve played lots of times against it,” cautioned Varo, it’s “more powerful than it seems.” Noted Triumph, “I know Elementals’ Path is a crazy mess…but I’m picking it to win. It’s got ramp, and the flexibility of Evoke, and I think it can shuffle off the slow-moving Mortal Coil.” Sure enough, the Elementals dusted their opponents in two straight. When the dust settled, we at last saw one of our predictors break free from the leading pack and declare himself the frontrunner! Here’s the updated table, and as always please let us know of any discrepancies and we’ll be happy to take a look. Will Triumph extend his lead and lay sole claim to the mighty prize awarded to the winner, $100 worth of Magic? Or will another nail their calls and edge past? We shall see! Game 23: IMO, this is the really tough choice for this round. Both decks seem so swingy and fragile and reliant on certain cards / vulnerable to a bad draw that I can see either deck walloping the other in a 2-0 blowout. It feels weird to say it, but I am voting for Elementals’ Path to win because I think the 5-color deck is probably a little more consistent and resilient than the Soldiers. Battalion has a few key power cards (chiefly Preeminent Captain, to a lesser degree stuff like Veteran’s Armaments, etc.) that it needs. The Flamekin and their multicolor friends seem less dependent on any particular card to work, and have enough mana fixing / ramp that I think they’ll do all right. Game 24: Merrows FTW! The Merrows seem to have a nifty deck with a lot of cool tricks and synergy; I hope it turns the boring Turnabout on its head. Card drawing, evasion, potentially infinite reinforcements late game, a trio of O-Rings – this definitely looks more solid than Turnabout IMO. Game 28: I’m guessing Merrow Riverways wins the division. In a field where every competitor could be called swingy, inconsistent, and complicated to play, I think the Merrows are more likely than any of their opponents to get their act together somewhat reliably. It’s a (relative to the other three decks in the fight at this point) well-rounded deck, with draws, evasion, removal, early and late game tricks, etc., and I think it’s also probably a bit less complicated than the competition (here’s looking you, [flame]kid). 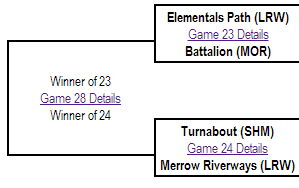 I can easily see the Merrows going to three games in each match, but I think they are the most sensible pick to achieve final victory. …now watch as Turnabout and Battalion win and I feel silly. LOL. Whatever happens, thanks for doing these! They are fun read, and deck analysis / predication makes for quite fun game of its own! Game 23: Battalion. Definitely have faith in it. Game 24: Turnabout. Keeping faith in the lieges, even though they didn’t do so well. 23: Battalion – Path did great against the extremely clunky Mortal Coil, but I don’t think it can stand against the much more efficient Battalion. Lords and solid removal that can hit non creature permanents. Battalion wins this match. 24: Merrow Riverways – Two words. Card Advantage. A tried and true method of winning games of magic. Merrow packs creatures that are nothing but card advantage with a sweet removal suite and a way to make a million dudes. Merrow slams this one, no question. 28: Merrow Riverways – Sad to vote against my beloved Kithkin but it is true. Riverways just has too many ways to win. I think it goes to three games, but in the end the Merfolk reign supreme. Faith in the decks i know. 23: It’s a tough choice. I’m going… Elemental. It may be 5C, but its heavy red at face CMC. Oh and it has tutor! Didn’t notice that before. 24: Merrow Riverways. That deck is nuts. 28: Card advantage vs evoke, a tutor on a stick, and such. I’m going Elemental for the hell of it. Not every day I go against raw advantage. Oh man, I keep going back and forth, and these could be bad choices (a minute ago I was completely opposite these picks)… we’ll see! Hahaha. Yeah, a 1-point lead doesn’t count for much. 😀 I really do think this is a pretty evenly balanced final four for this division – any of them could win and I wouldn’t be surprised. Elementals’ Path coming out on top.